US philanthropist Loretta Brennan Glucksman was the recipient of the annual Tip O’Neill Irish Diaspora Award for 2015. 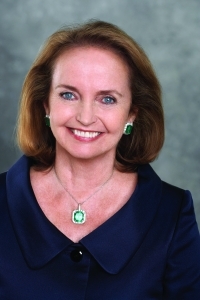 Loretta Brennan Glucksman, has been involved in philanthropic endeavours for more than two decades, focusing on education, the arts, healthcare and peace initiatives in both the United States and Ireland, a passion she shared with her late husband Lew Glucksman. Her grandfather, David Brennan, hailed from Inishowen fishing port, Greencastle and her grandmother was Alice Moore from Co Leitrim. Ms Glucksman is the Chairman Emeritus of The American Ireland Fund (AIF), where she served as its Chairman for 18 years before stepping down in December 2013. During that time, the AIF exceeded its goal of raising $100 million under the Promising Ireland Campaign and reset the target to $200 million. She is Co-Chair of Glucksman Ireland House founded in 1993, the centre for Irish Studies at New York University (NYU), and she serves on the Board of Arts and Sciences at NYU. She also is Chairman of the University of Limerick Foundation. Loretta is also a long-time staunch supporter of FACES (Finding A Cure for Epilepsy and Seizures), which is affiliated with the NYU Langone Medical Center. Mr and Mrs Glucksman established the Glucksman Chair of English and American Letters at NYU and the Glucksman Chair of Irish and Scottish Studies at the University of Aberdeen. In 2002, University College Cork officially opened the Lewis Glucksman Gallery; in 2001, the couple established the Map Conservation Library at Trinity College, Dublin and in 1998 they helped build the Glucksman Library at University Limerick. In Ireland, Ms Glucksman served on numerous boards including IDA Ireland, The National Gallery of Ireland, The National Library, The National Concert Hall, The Abbey Theatre, Trinity College, University College Cork, The Royal College of Surgeons, Smurfit School of Business at the University of Dublin, and Cork Airport Authority. In 2002, she was conferred an Honorary Commander of the British Empire by Her Majesty Queen Elizabeth, the highest honour for a non-British citizen, for her work toward peace in Northern Ireland. She also received honorary degrees from the Universities of Scranton, Fairfield, Trinity and Cork and she is an Honorary Fellow of the Royal Irish Academy, The Royal Dublin Society and the Royal Irish Academy of Music. Ms Glucksman has hosted radio programs in New York City and delivered speeches to groups in the U.S. and abroad. Earlier in her career, she was a television producer and on-air host for news and public affairs with PBS. She was also a lecturer in English literature at several universities.